A criminal investigation is underway into the Miami Beach building collapse as the sole victim recovers in the hospital in critical condition. NBC 6's Laura Rodriguez and Jamie Guirola report. At least one person was hospitalized when a Miami Beach building that was being demolished collapsed Monday morning, officials said. Miami Beach police and firefighters responded to the scene near 57th Street and Collins Avenue after the collapse happened around 10 a.m.
Footage posted on social media showed the 12-story building quickly collapsing in a cloud of dust and debris. 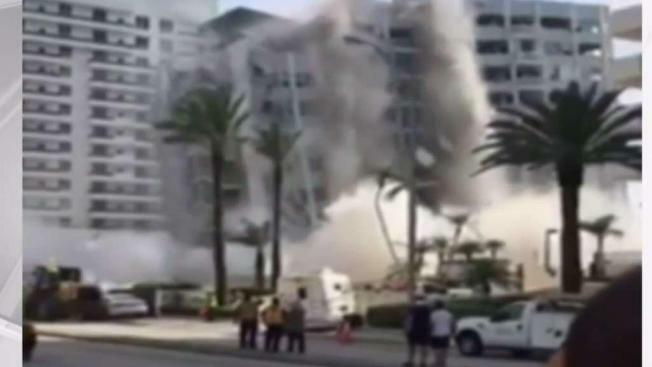 RAW VIDEO: A witness captured the Miami Beach building collapse on video. Miami Beach Fire Rescue confirmed that a man who was injured at the scene was transported to Jackson Memorial Hospital in critical condition. He was later identified as 46-year-old Samuel Landis. Officials said everyone has been accounted for by the construction company but technical rescue teams searched the site to make sure there were no other victims. Search dogs assisted but no other victims were found, officials said. Police said the building had a permit for demolition. The site is home to the old Marlborough House, an apartment building built in 1961 that was being taken down and set to be replaced by a new luxury high rise. "During that demolition something went terribly wrong," Miami Beach Mayor Dan Gelber said at a news conference Monday afternoon. Winmar Construction said Landis worked for Allied Bean Demolition, which was performing the project's demolition work. "Unfortunately, during the demolition, one of the Allied project managers was injured and was transported to the hospital for treatment," Winmar President Luis Leon said in a statement. "We continue to monitor his condition and our thoughts and prayers go out to Allied’s project manager and his family during this difficult time." Allied Bean officials said they had no comment. Witnesses said people were nearby watching as construction workers were demolishing the building when it collapsed. "The building finally collapsed and it collapsed towards Collins Avenue and debris started flying towards us," one man said. "A boulder about the size of the front end of a car flew across the street, hit a man that was standing, one of the construction men, and the boulder hit him in the center of his chest and threw him probably about five feet." Air quality inspectors also responded to the scene and confirmed that all asbestos was removed before the demolition. Police said they are conducting a criminal investigation into the collapse. OSHA is also investigating.